Have a ROARING good time creating this canvas painting at Bubble Tea Cafe!!! 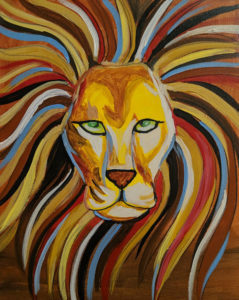 Bring your creativity and your inner-artist and create this Lion on canvas. Paint your lion the colors you would like! These paintings are done in a relaxed fun atmosphere. Included in the ticket price is one of Bubble Tea’s wonderful beverages, all painting materials and follow-along instruction. Apron provided too.